Huawei’s reputation in the US took a serious battering in 2018, a year bookended by major carriers shelving high-profile phone launches and the arrest of the company’s chief financial officer on fraud charges. Last week, however, a report and survey from the Financial Times suggested that the external controversies could actually be helping Huawei in its domestic market. Whatever nationalist boost Huawei might receive, however, is unlikely to do much to change its fortunes in China. The reason is simple: Huawei has been on an upward trajectory in its home market for some time and had an absolutely astonishing 2018 — largely at the expense of Apple and Xiaomi, among other competitors. There can be no serious analysis of the company without the recognition that outside the US, it is now a hugely successful consumer brand as well as a highly advanced technological force. “This [nationalist] sentiment might help Huawei’s overall brand image in China, however without competitive products, it’s impossible for Huawei to achieve such a success in 2018 in its domestic market,” says Mo Jia, an analyst with Canalys in Shanghai. “I think the major factor is Huawei’s aggressive technological innovation, which brings it to the same level as the top two smartphone giants, Samsung and Apple, in the global market.” Counterpoint Research director James Yan agrees, saying “I don’t think it is a significant factor in purchasing decisions,” instead citing strong photo capabilities, battery life, and performance from Huawei’s own Kirin processors as bigger reasons for Chinese consumers to choose the brand. Describing the Huawei Mate 20 Pro as “the best phone America can’t get,” The Verge’s Vlad Savov cited its “huge battery, slick design, and a superb processor, constrained by bad software and international relations.” The software isn’t an issue for most Chinese users, and the international relations certainly aren’t a negative for them either. 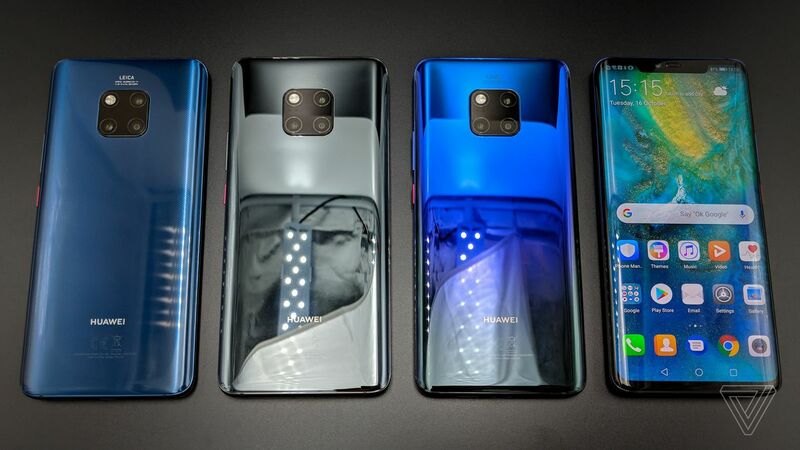 In that light, it’s not surprising that Huawei is continuing to establish itself as a top-tier phone manufacturer in the world’s largest market. Canalys puts Huawei’s share of the Chinese smartphone market at 27 percent, up 7 percentage points year-on-year, while the company’s shipments are said to have grown by 16 percent. This is particularly impressive given the overall stagnant state of the phone market in China, with IDC yesterday reporting a 10.5-percent contraction in shipments. Oppo and Xiaomi managed to slightly increase their share, for example, but saw overall shipments decline year on year. The market is maturing and consolidating, with Huawei the biggest benefactor yet. “[Huawei’s] attempt of strengthening the brand image through technological innovations [has] seen strong progress,” says Jia. “It has significantly helped Huawei’s high-end performance with the P and Mate series, most importantly. The halo effect also helped Huawei’s overall brand image, thus, to become an attractive and trustworthy brand in China. Besides, Huawei is the only brand that could compete with Apple in terms of brand image in the high-end space in China after Samsung’s failure.” Samsung’s share of the Chinese market shrunk to a single percent in the final quarter of 2017, according to Counterpoint. Market share isn’t everything, of course, and Huawei’s phone business isn’t anywhere near as high-margin as Apple’s. But Apple largely blamed the iPhone and China for its unusually poor quarter last month, and it can’t ignore the fact that it’s losing customers to Huawei in the region, particularly as it continues to push the narrative that it’s a services company. 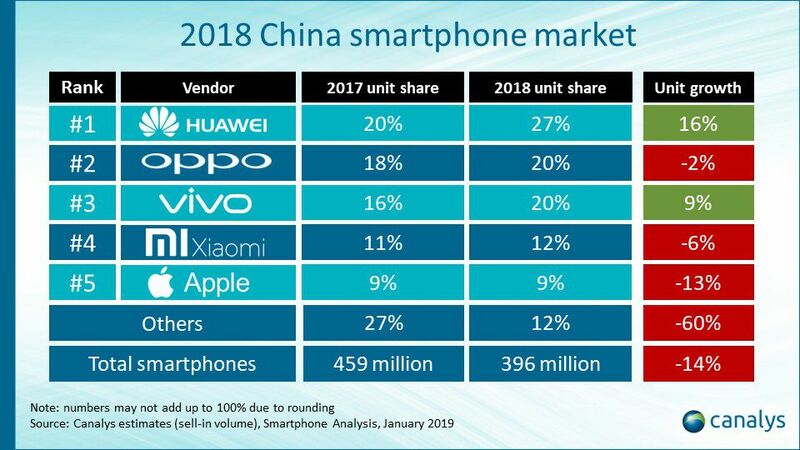 It also seems very possible that Huawei could overtake Apple to the position of second-biggest global smartphone vendor — just behind Samsung — over the whole year even without any presence in the US market. (That actually happened in the second and third quarters of 2018.) Apple CEO Tim Cook has blamed currency fluctuations for the high cost of iPhones in China, and the company will reset prices for affected regions. “We’ll see how that works out for us,” Cook told NPR yesterday. “The big Chinese players, including Huawei, have grown at the cost of some of the smaller domestic players in a market where smartphone penetration has already reached quite high levels,” agrees Kaur. “There could be some further consolidation in the China market which could help players such as Huawei further consolidate their share in the market.” Counterpoint’s Yan, meanwhile, predicts that Huawei’s Chinese market share will grow because of a lack of “outstanding highlights” from competitors over the next year. The decision to buy a particular phone can be intensely personal, and there are countless factors that affect it. What is clear is that in China, and many other countries in the world outside the US, there are a lot of strong reasons for customers to pick Huawei devices. Of course, the popularity of consumer products isn’t going to shift any government’s position on, for example, the national security issues raised by allowing a Chinese company with a dubious history to build 5G infrastructure. But it’s worth reflecting on how and why Huawei is able to beat companies like Apple in China. However much patriotism might come into play, it’s less of a factor than the reality that Huawei has emerged as an inarguably strong competitor at every tier of the market.